Hello There Friends and a Happy Monday to you! I hope you’re all doing well. 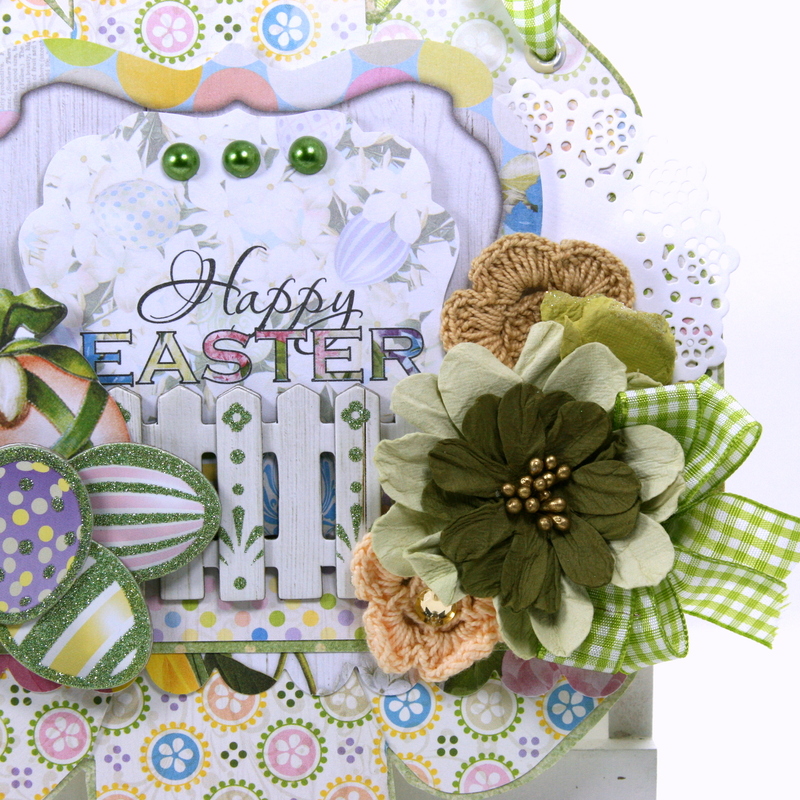 Ginny here today to share a fun and vintage-y holiday wall hanging I created for Easter. 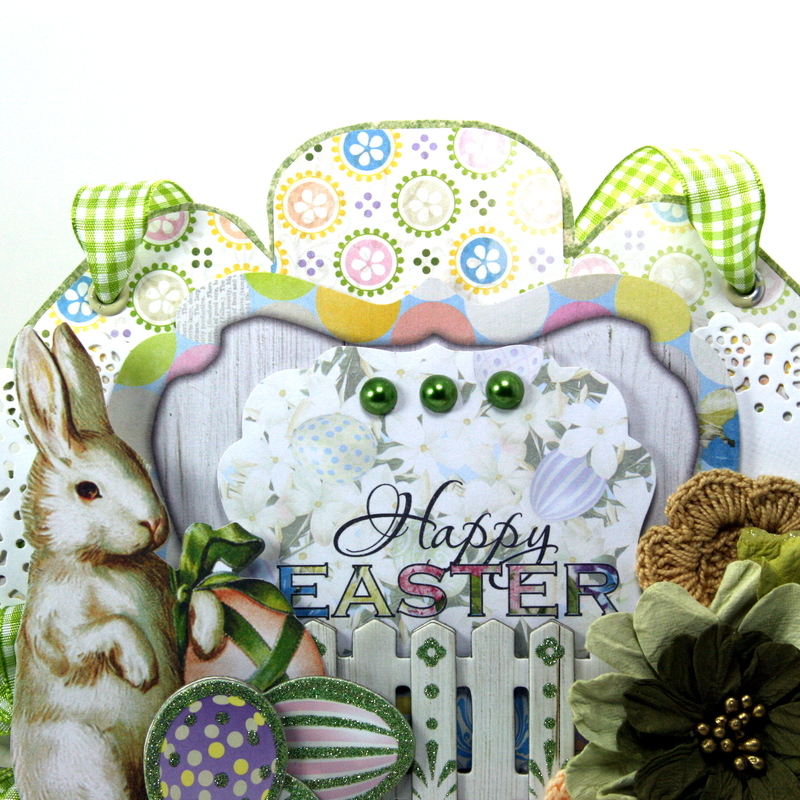 Spring has sprung and I’m so excited to use this colorful and fun new BoBunny paper! 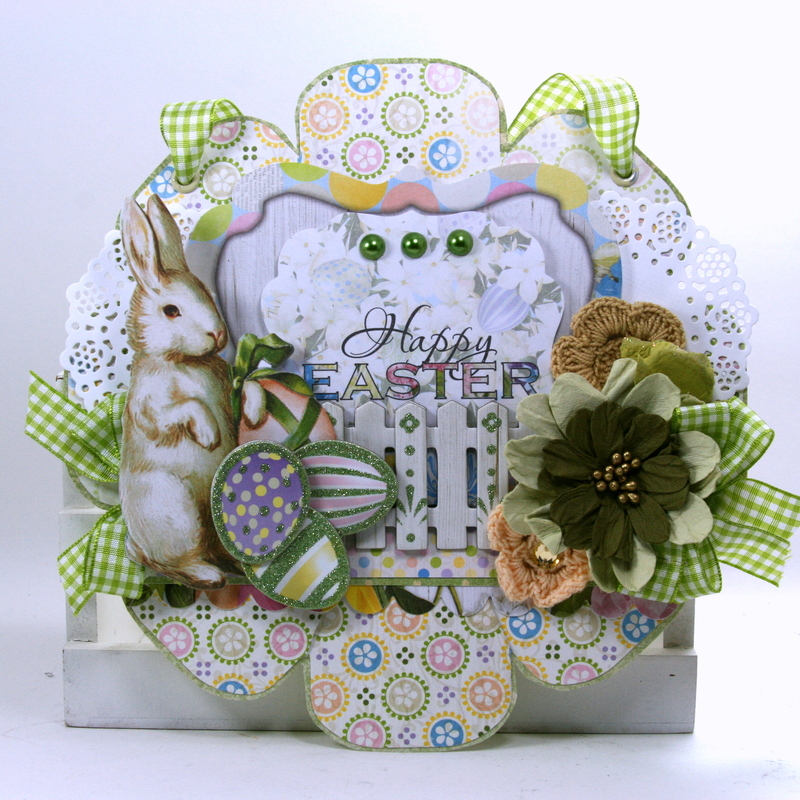 I’m using the oh-so-sweet Cottontail Collection for this charming little decor piece. For the base I created a large flower with the We R Memory Keepers Flower Punch Board and some patterned paper then added it to a layer of Double Dot cardstock for a nice border and to give a bit of sturdiness. 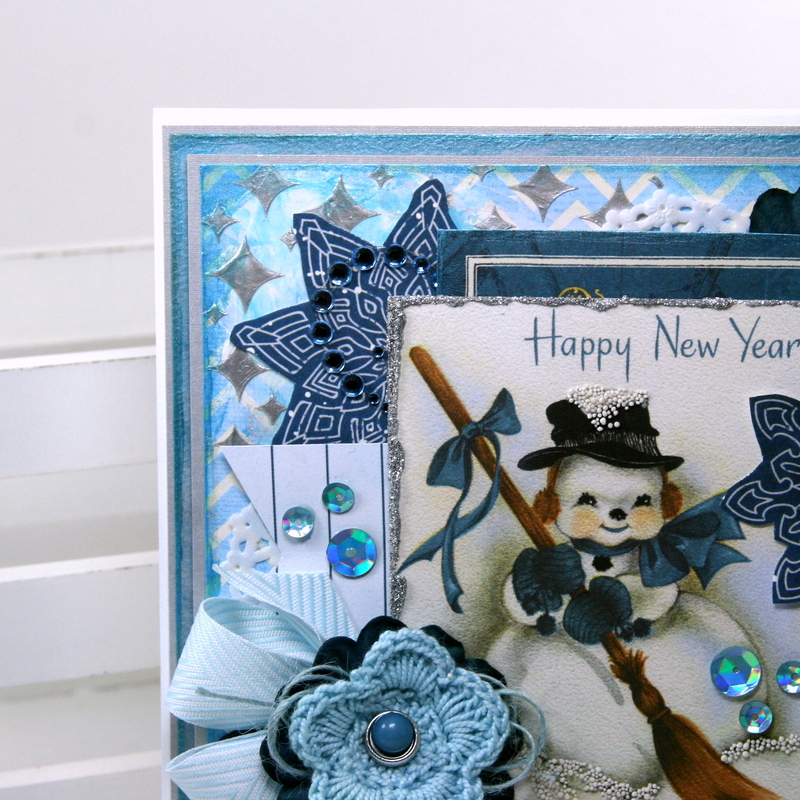 The Noteworthy die cuts have a fabulous selection of coordinating themed elements to choose from. 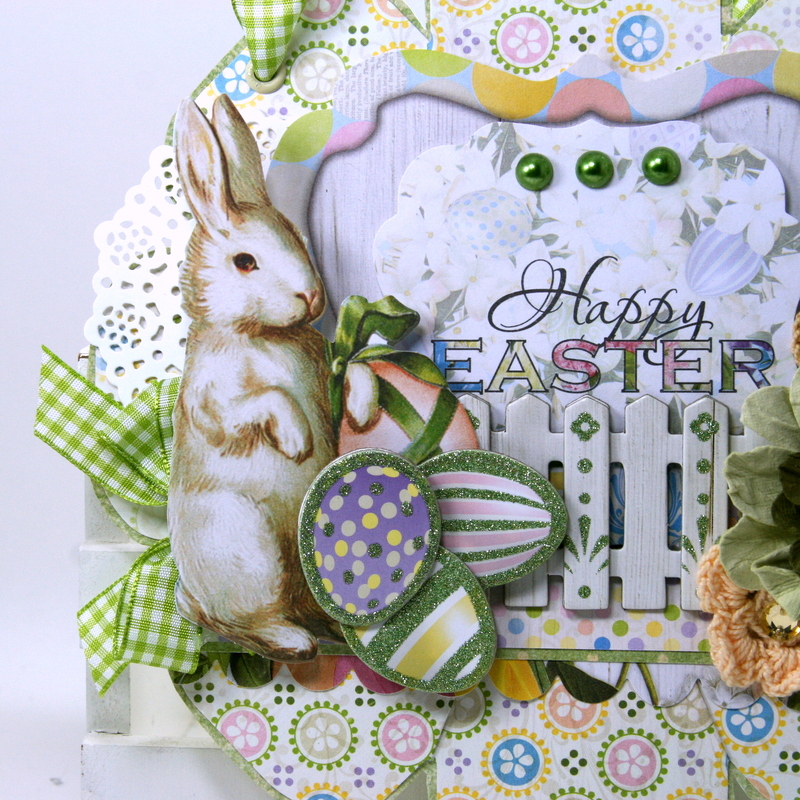 I was going for a shabby chic color scheme so I picked the white fluffy bunny and layered it over the picket fence from the Layered Chipboard Stickers. To balance the right hand side of the wall hanging I added an arrangement of BoBunny Blossoms to coordinate with the patterned papers. 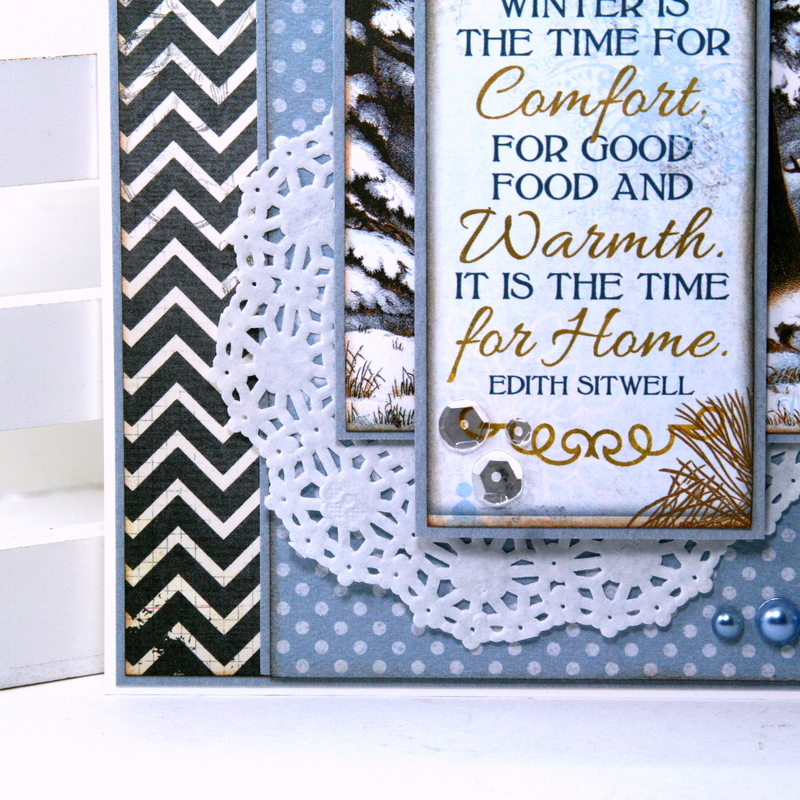 Additional patterns from the collection, the Double Dot paper and the scalloped edge from one of the die cuts add detail and interest to the bottom. A few eyelets with gingham ribbon strung through create a hanger for displaying. Doilies tucked in create fullness in the arrangement and provide a break from the busy patterns. Last but not least a few Double Dot Jewels for a little sparkle and shine. Sit back and watch the step by steps if you’d like! Thanks for dropping in today! See you again soon! Hello there and happy Tuesday friends! A great day for a fun hop with the folks here at Really Reasonable Ribbon. 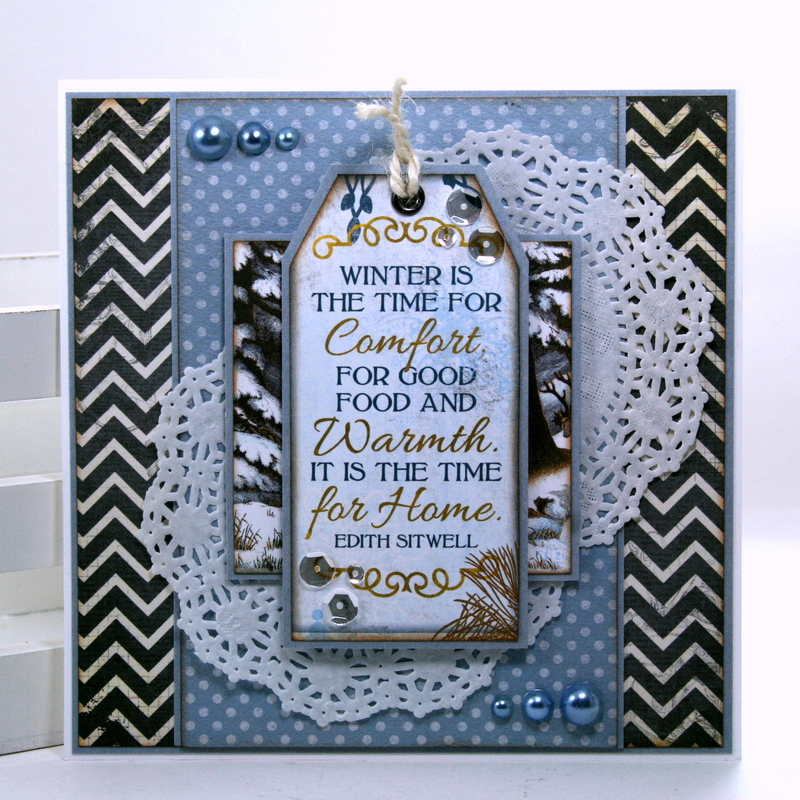 We are sharing the project we created with the March Ribbon Club Assortment. You should be coming to me from the Really Reasonable Ribbon Blog. You’ll want to start there so you won’t miss out on any of the fun. I created a fun flip book mini album scrapbook embellished with a bow created with the beautiful ribbon that coordinates with the patterned papers perfectly! 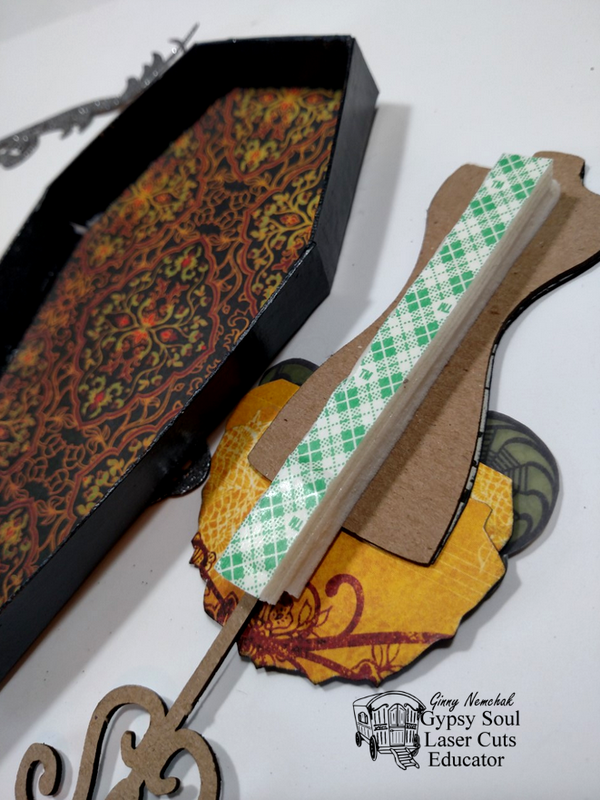 I had so much fun creating tip ins that add a huge amount of real estate in a mini….just think of all the pictures and journaling that can be added! Pockets hold tags but could also hold mementos like tickets or other flat keepsakes. Did I mention tags? I’ve added them in layers….you can never have enough tags! 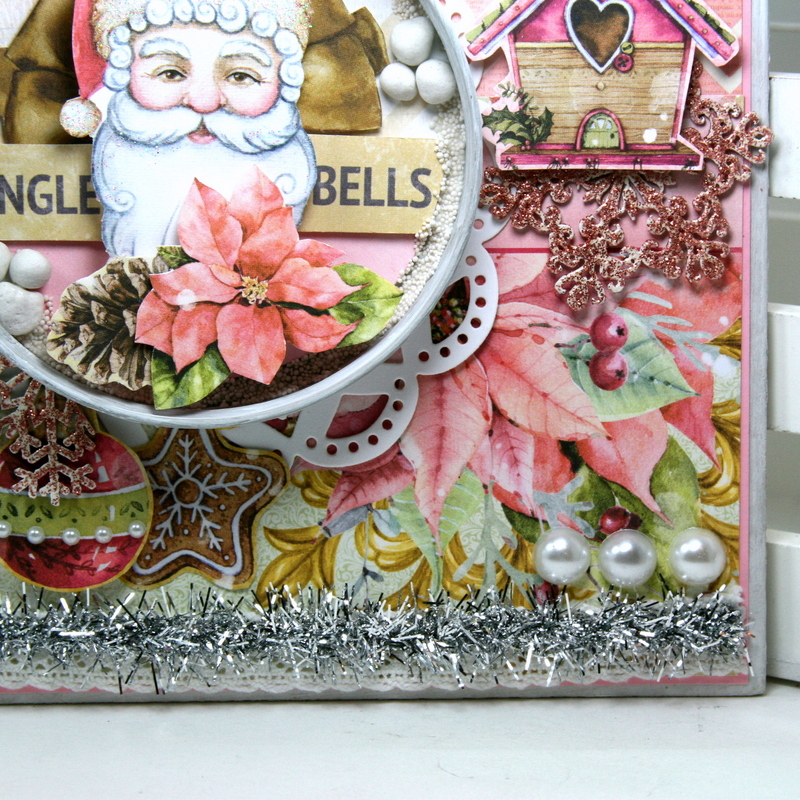 A great way to add interest to the pages is to add border strips to the top and bottoms of the pages. This set of pages have more pockets and tip ins. Each of the inside pages have a large pull out of matted coordinating paper for larger pictures. There are 4 in this book so you won’t run out of room to add all the special memories. 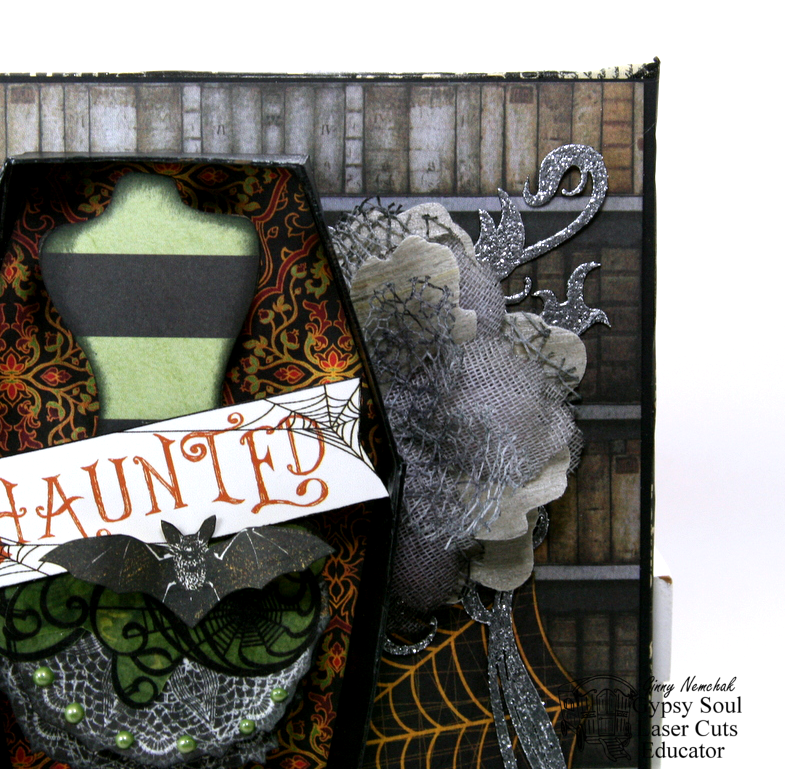 The back of the book has a fun cut apart journal card that is great as is…but could be used to write a sweet sentiment. 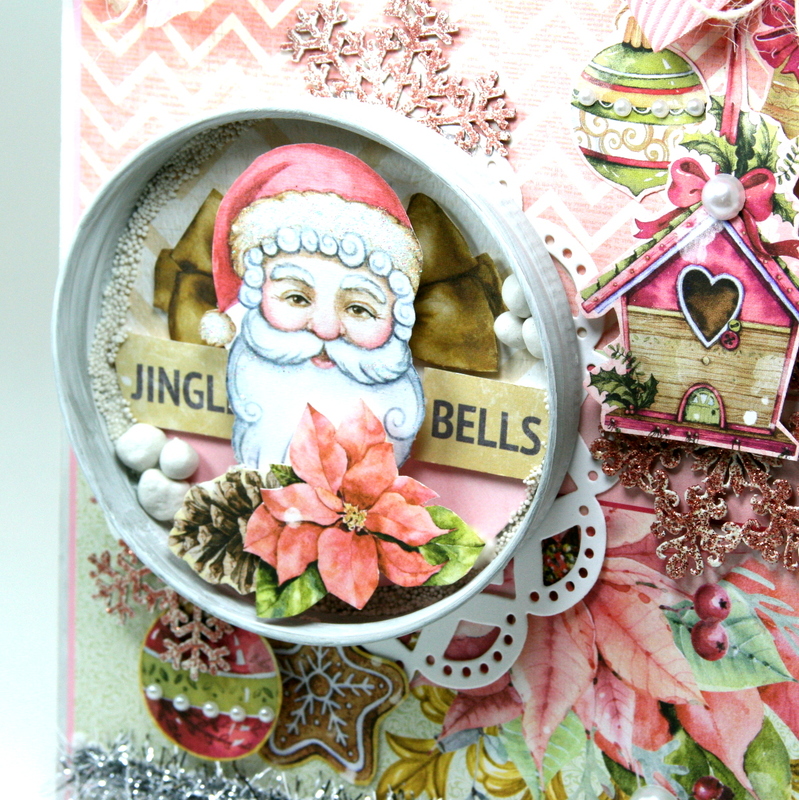 Please enjoy this flip through video of this flip book……. Your next stop in the hop is the lovely Miss Cheryl. 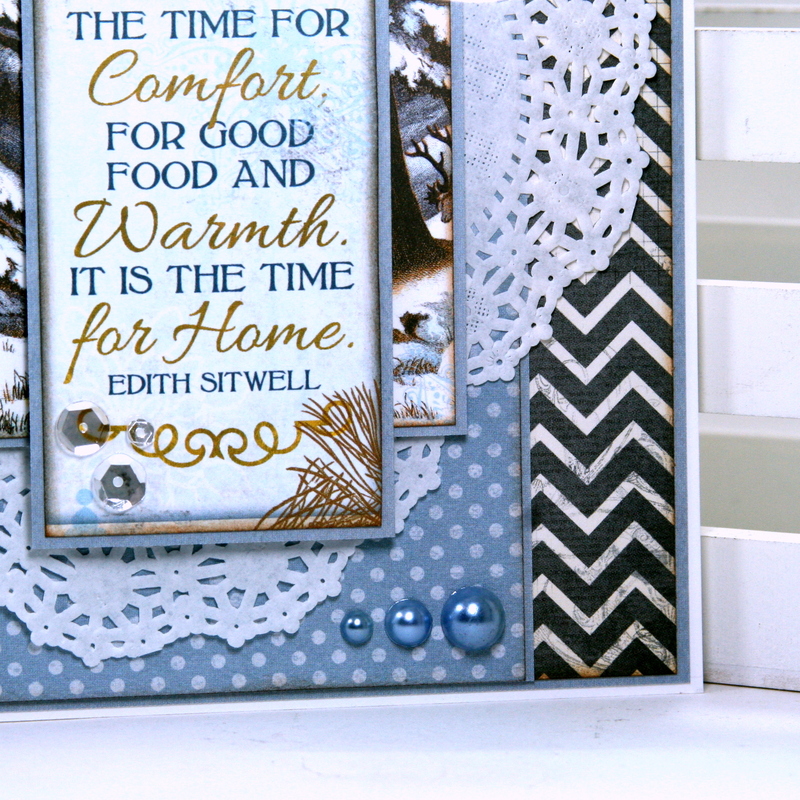 Ginny here to share two cards made from the same collection. In fact they are made from the same sheet from the new On This Day collection. 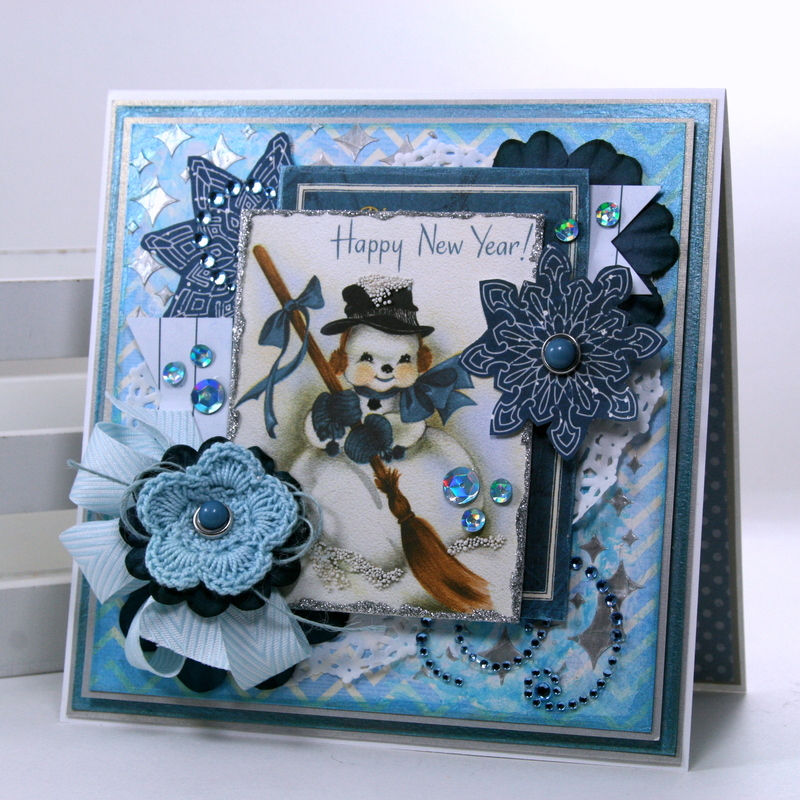 Two cards with two very different looks…..
For the first card I went all out with the layers and embellishments. The sweet little snowman was the inspiration. 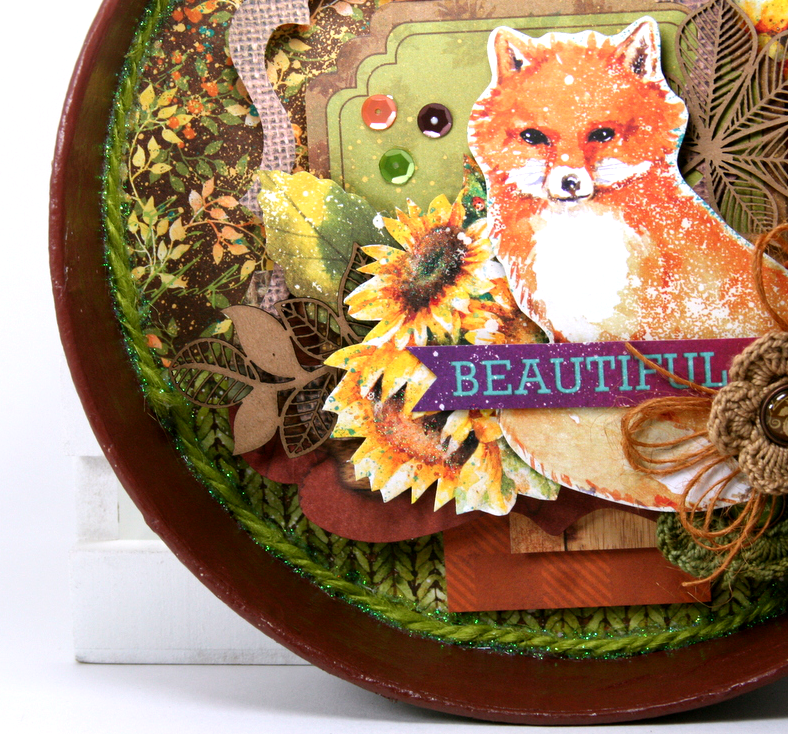 I created loads of added detail and texture with mixed media supplies and stencils. 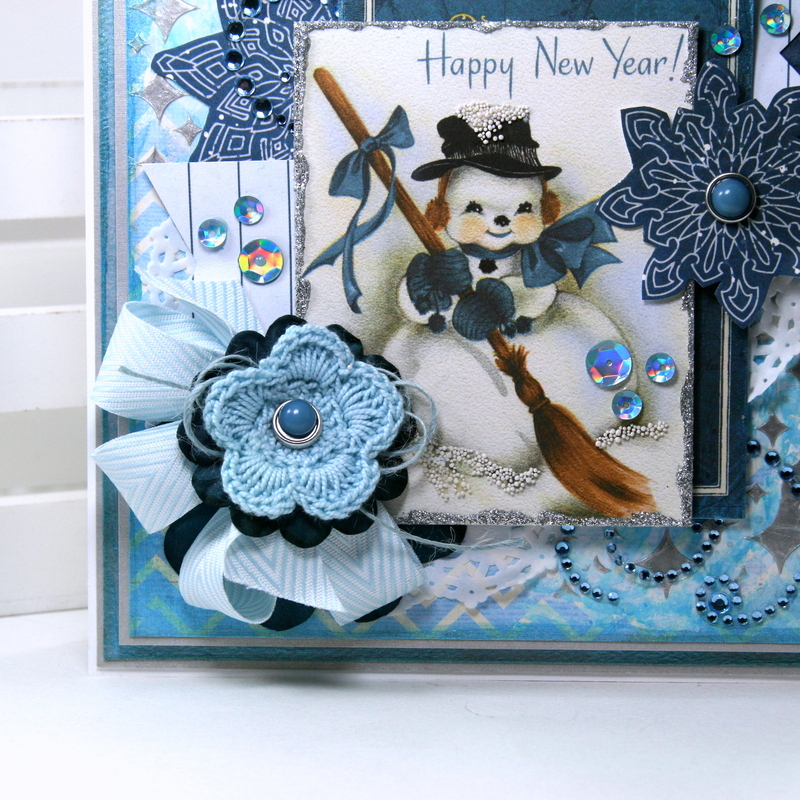 The 3D powder added to the snowman creates a frosty look. All the papers were edged with Pearlescents in Brilliant Blue. I fussy cut snowflakes from the reverse side of the 12 x 12 sheet and added brads to create perfectly coordinating embellishments. 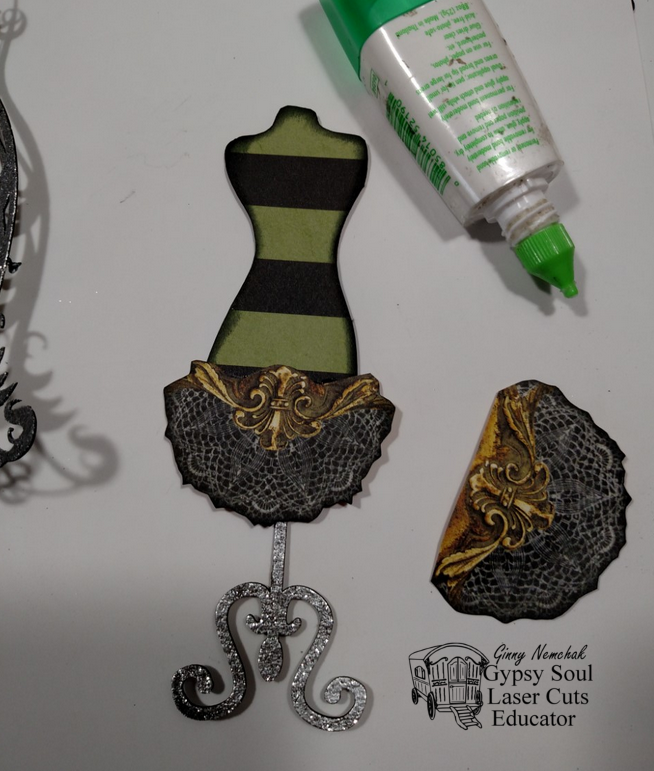 To accent the edge of the image I applied a generous coat of Silver Glitter Paste. I divided the Double Dot Flourish into two parts and added a bit to the top and bottom corners. Last but not least layered paper and crocheted flowers with ribbon and twine. 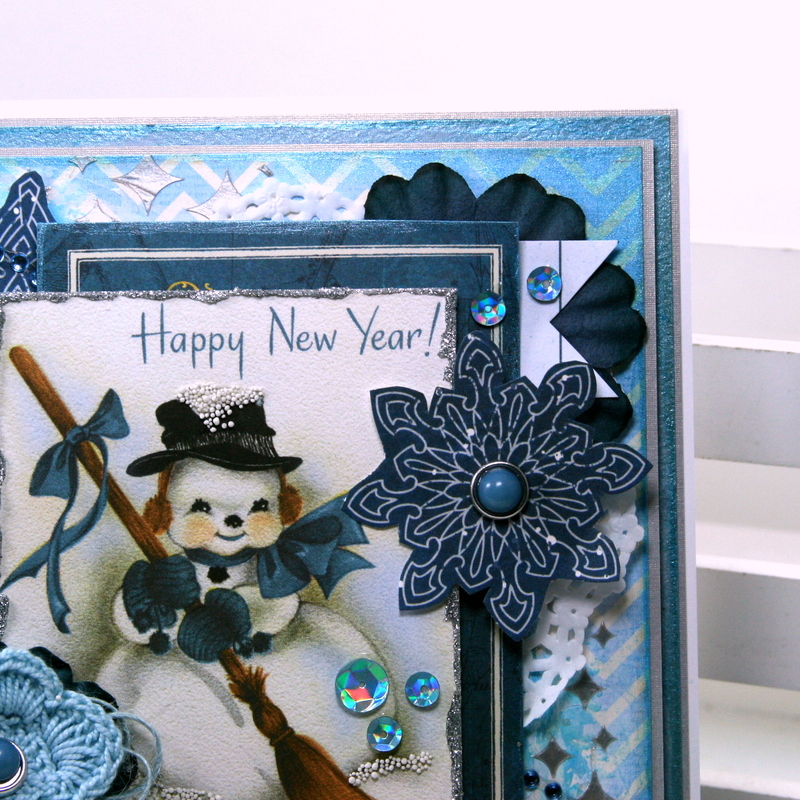 A sprinkling of matching sequins to finish off this card. For the second card I’m still using the images from the January sheet but this time going in a much more restrained direction. I’m calling this a “woodland” inspired look mostly because there’s a woodland in the image behind the tag. 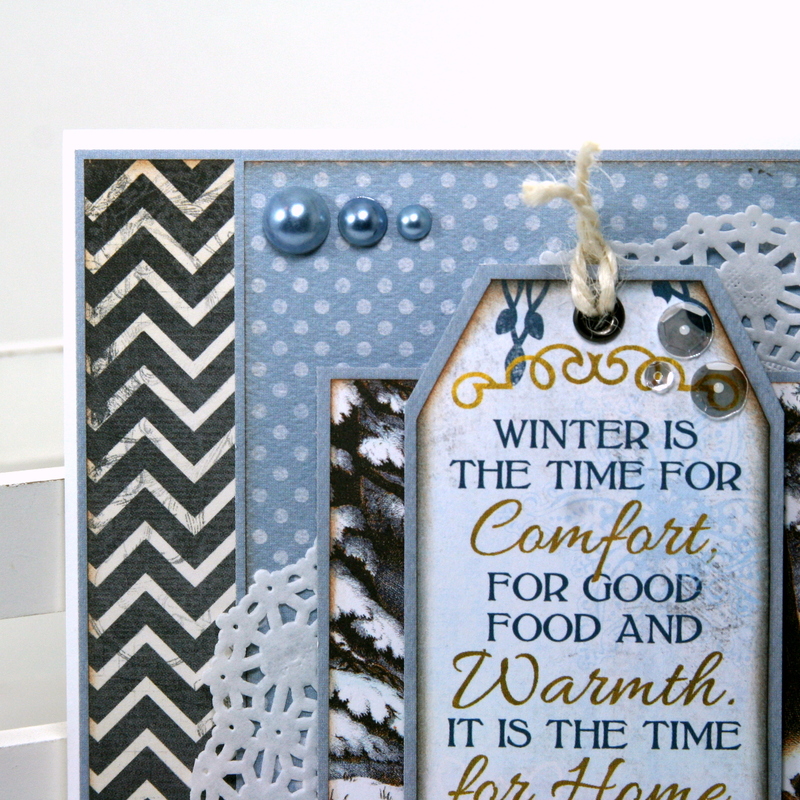 I brought in Double Dot papers in dot and chevron that coordinates with the tag. I’ve alternated the scale of the patterns to keep it from getting busy. Spacers between the layers builds in depth and dimension. Instead of one large doily I added two smaller ones and added them in an offset orientation. Double Dot Jewels and clear sequins add detail without being over-the-top-busy. Please enjoy this video I’ve prepared …. Hello there Peeps! Well I’m happy to say that the holiday season is upon us. Sadly that also means that winter is upon us. There is one way to combat the elements and that is with a winter survival box filled with essential supplies to get you through. 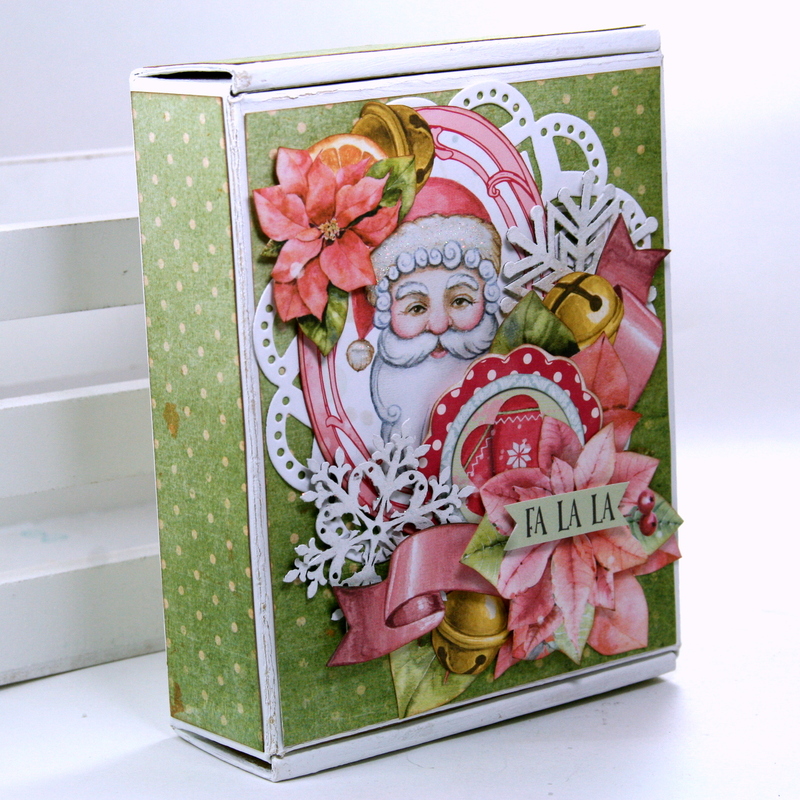 For today’s project I’m turning that idea into a present by tucking all the supplies into a handcrafted gift box using the Carousel Christmas paper collection. 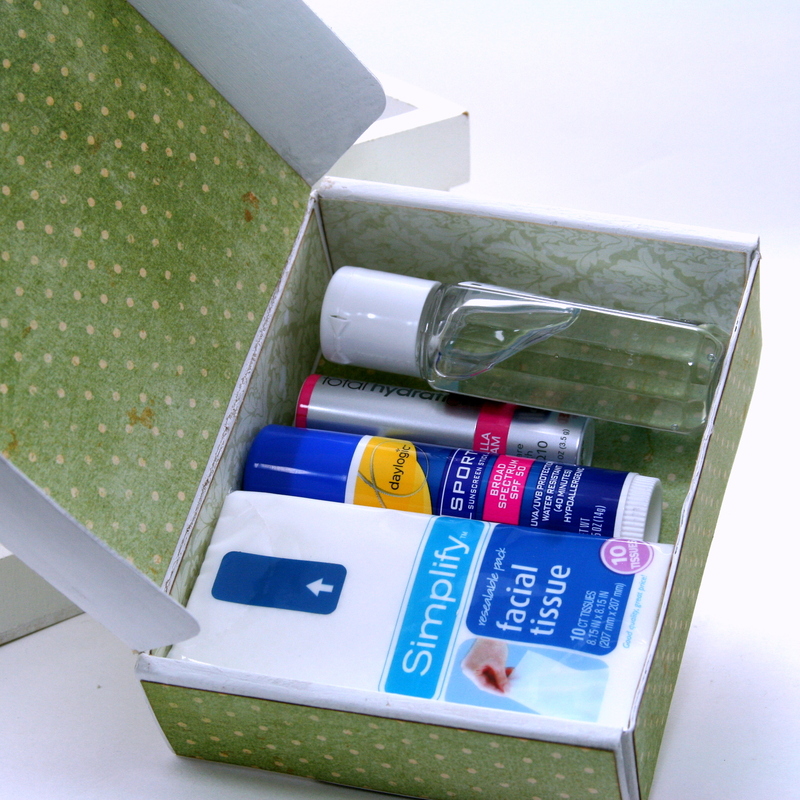 Another great thing about this project is I’m re-purposing a box from the recycling bin hooray!!! 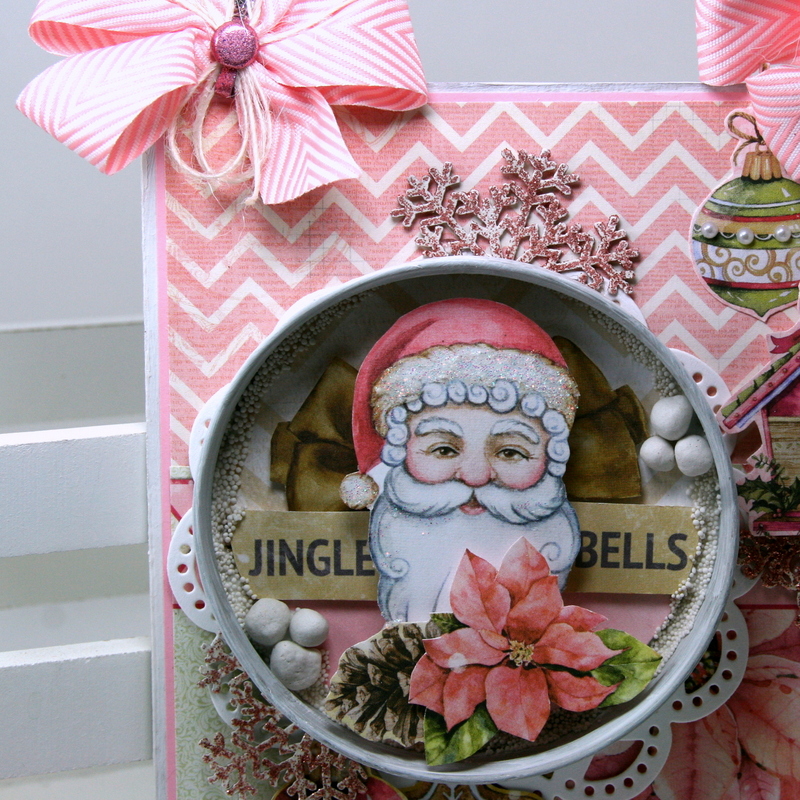 I think this combination of pinks and greens is shabby…but updated and fresh. 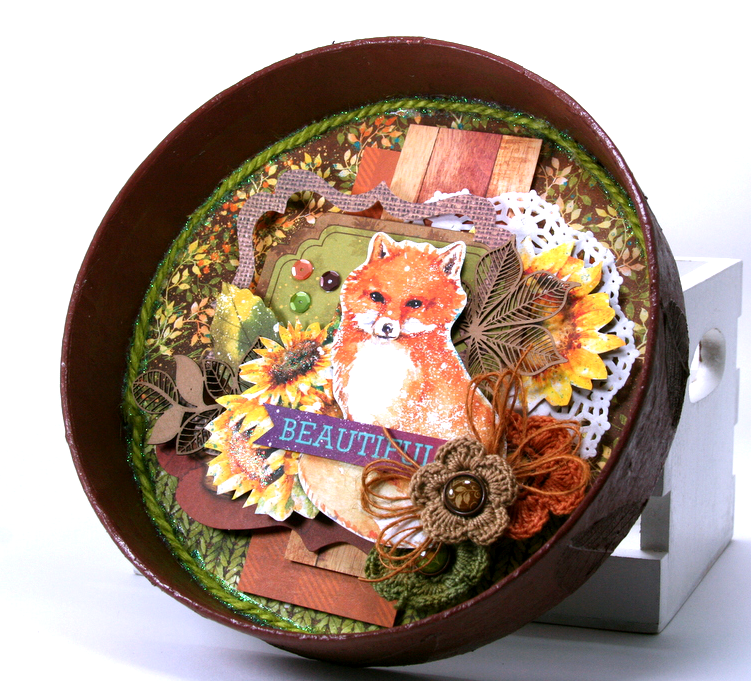 I’ve piled on the fussy cut images to create a nice full arrangement. 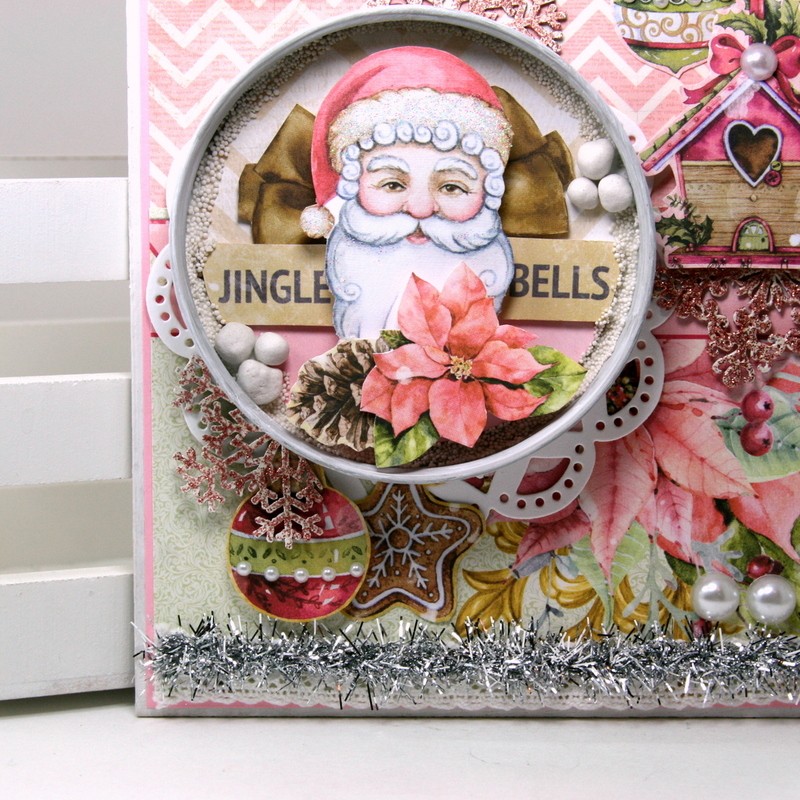 Adding the layers with spacers helps to keep it from looking busy. 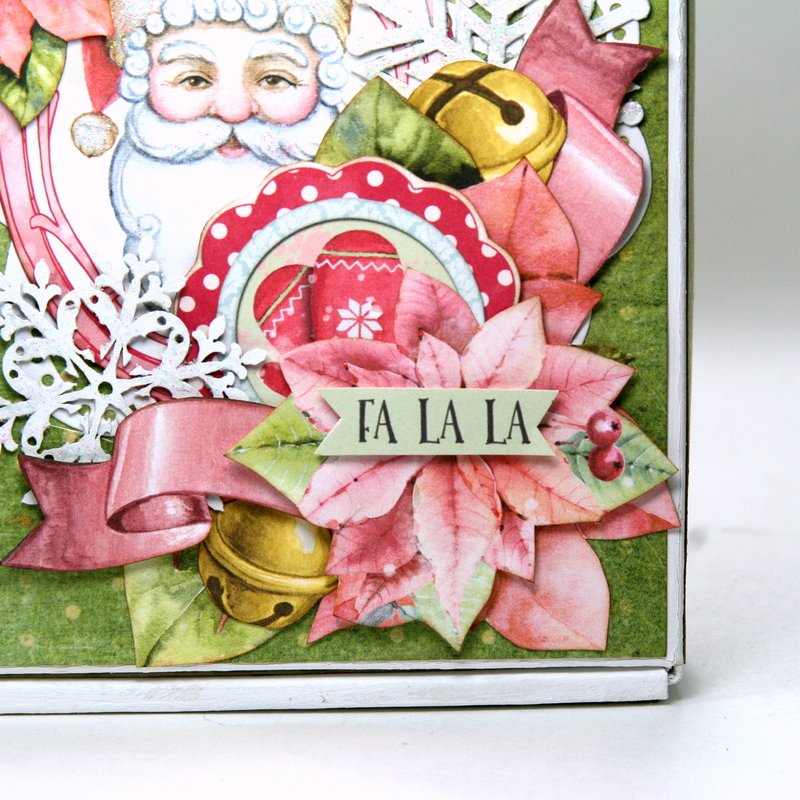 Painted and glittered chipboard snowflakes really adds a lovely texture and great detail. The sides and back are finished with the patterned papers. Now it’s time to fill up the box. I’m adding tissues, sunblock, hand sanitizer, and a hydrating lip balm. This is a great gift for teachers or local postal peeps. I’ve created survival packs for the woman who directs traffic at the school during drop off and pick up times and she really appreciated the supplies. You could also fill the box with baked treats, a small gift, or gift card. Hey there Chrsitmas Peeps! 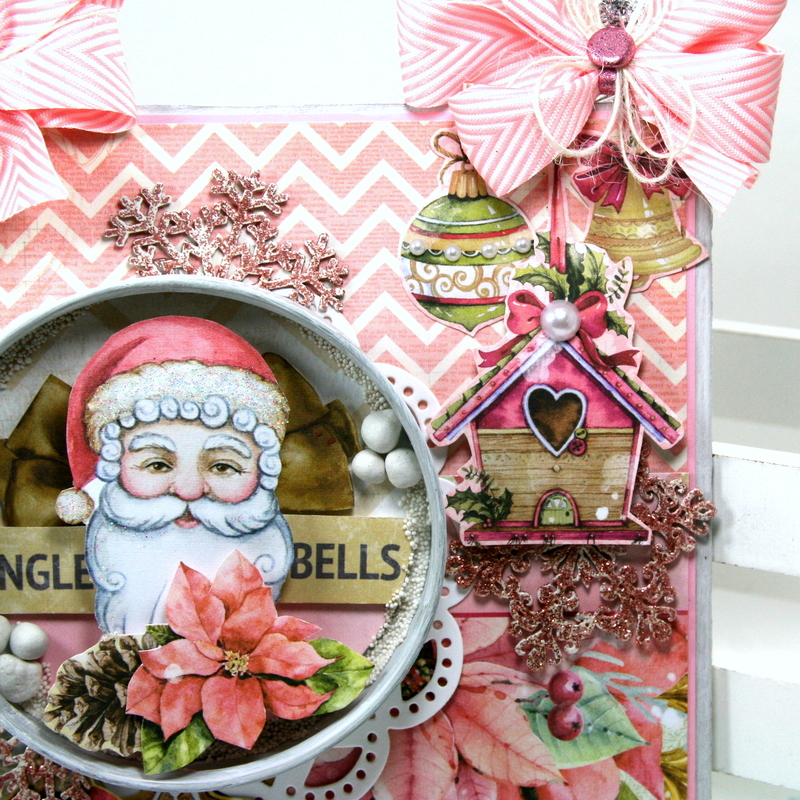 I’m sharing a very sweet and shabby chic inspired Christmas wall hanging using Carousel Christmas from BoBunny. Not gonna lie..I kinda love it! I just think Carousel Christmas is the dreamiest holiday collection. 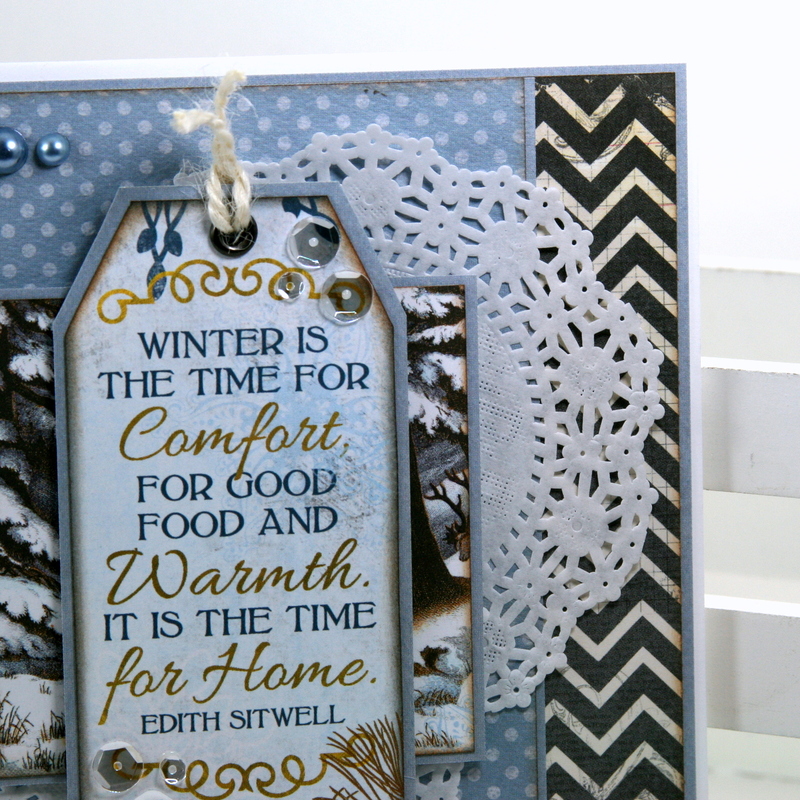 I started this project thinking I wanted to create a shadow box styled ornament with painted mason jar lid…but before I knew it I had a wall hanging in front of me. 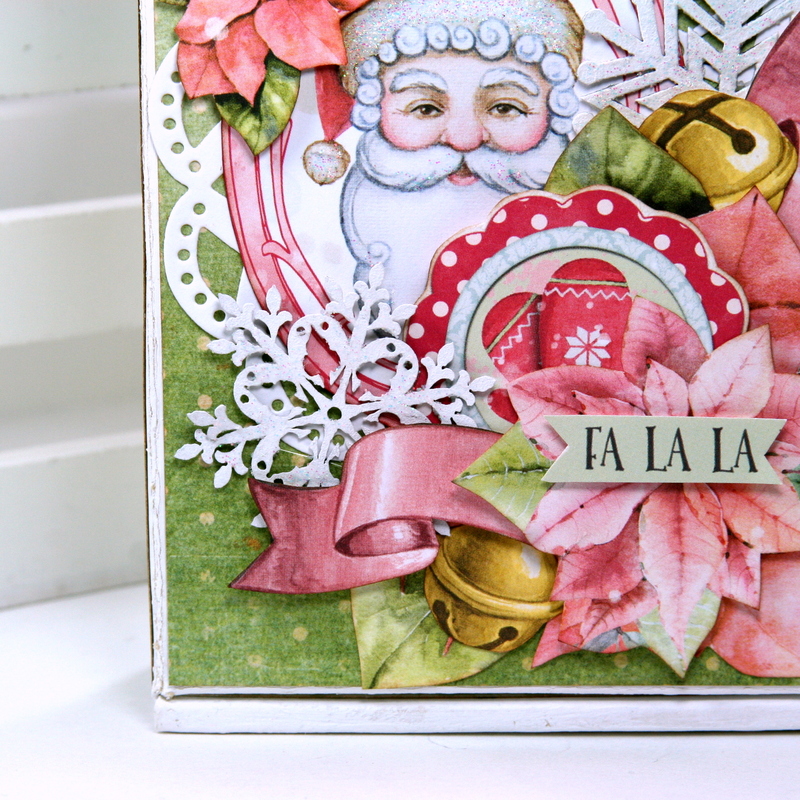 The lid is finished with a coat of Gesso then filled in with festive images and accented with faux snow for a frosty look. 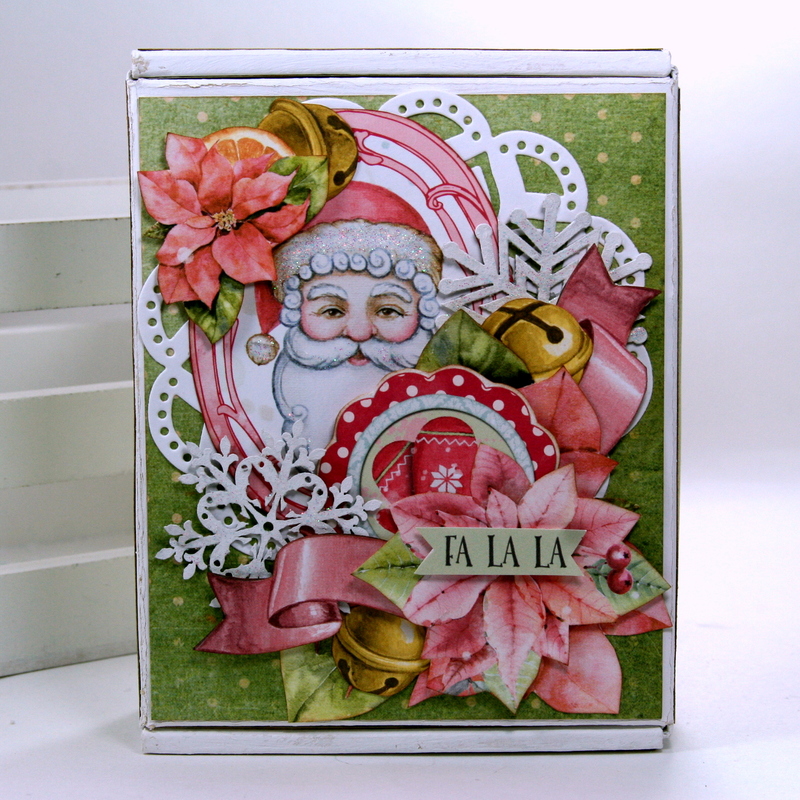 Additional images are fussy cut and layered on with spacers for nice dimension. I’ve added a tinsel hanger and coordinating bows to hang. 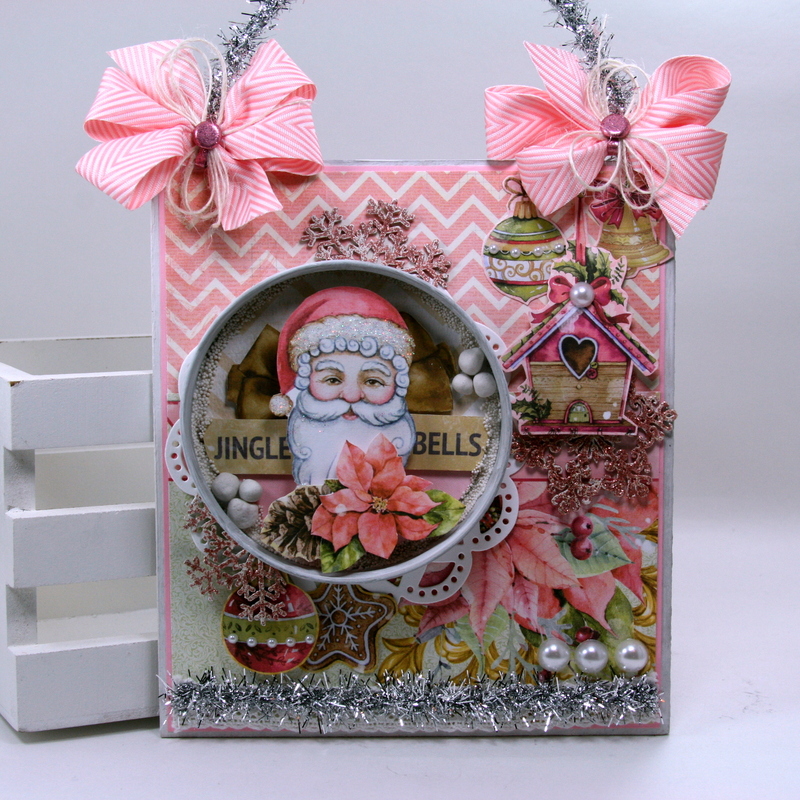 The chipboard snowflakes are also finished with the Gesso then top coated with Glitter paste….because every shabby chic wall hanging needs pink sparkly snowflakes. You can see the dimension I was able to get by adhering the elements with foam spacers between the layers. 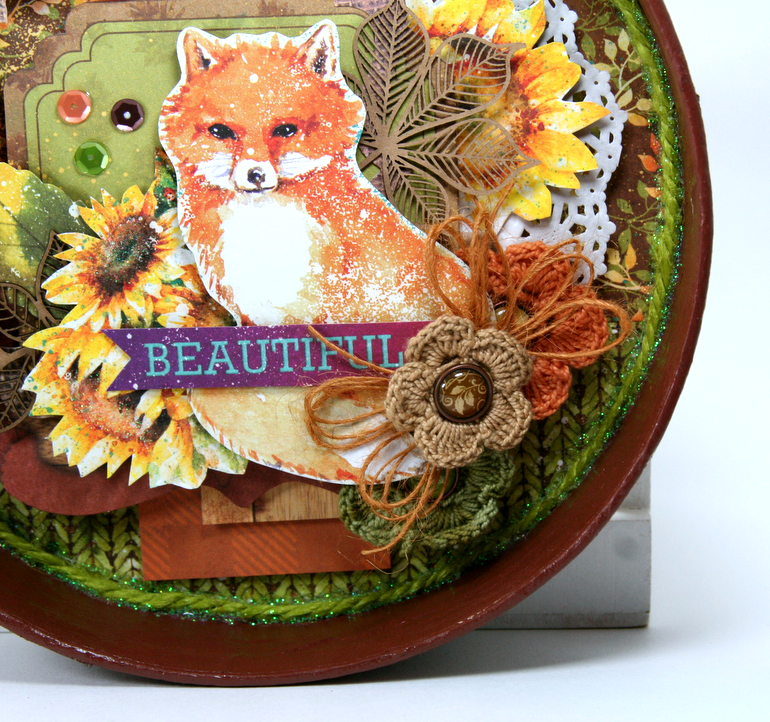 There’s a bit of the die cut doily peeking out here and I think it adds texture as well as a visual break from the patterned papers. Really Reasonable Ribbon~ Chevron Striped Twill in Pink, Ivory Burlap String. Hey there Peeps. 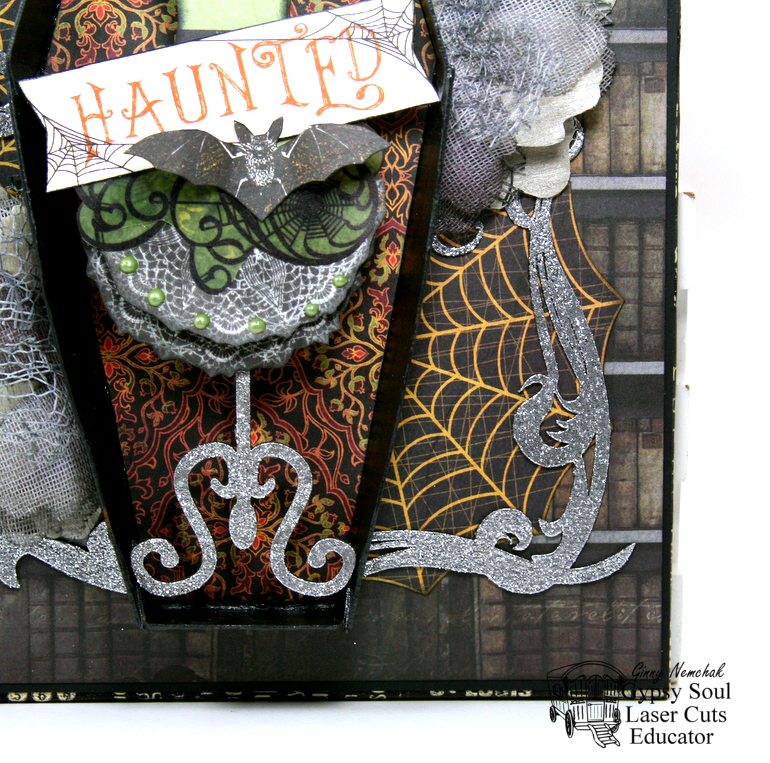 Ginny here to share a Halloween project created with some fabby chippies from Gypsy Soul Laser Cuts. It’s a haunted dress shop!!! How fun is that? 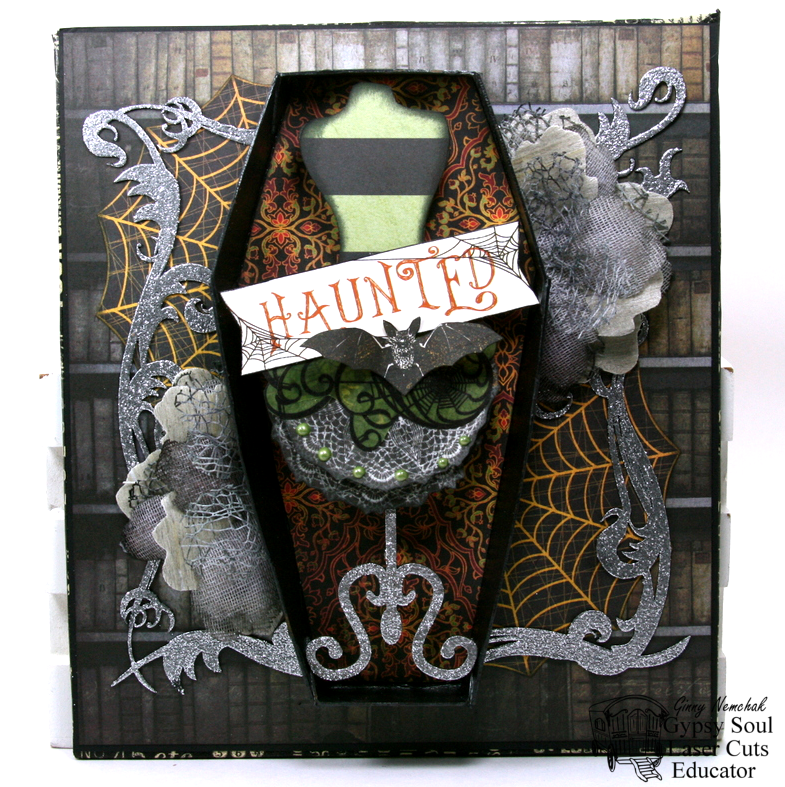 I’m using the frame to the Coffin Box to create a bit of a shadow box. There’s a glittery flourish layered over a fussy cut spiderweb. Flowers with netting add a great texture. 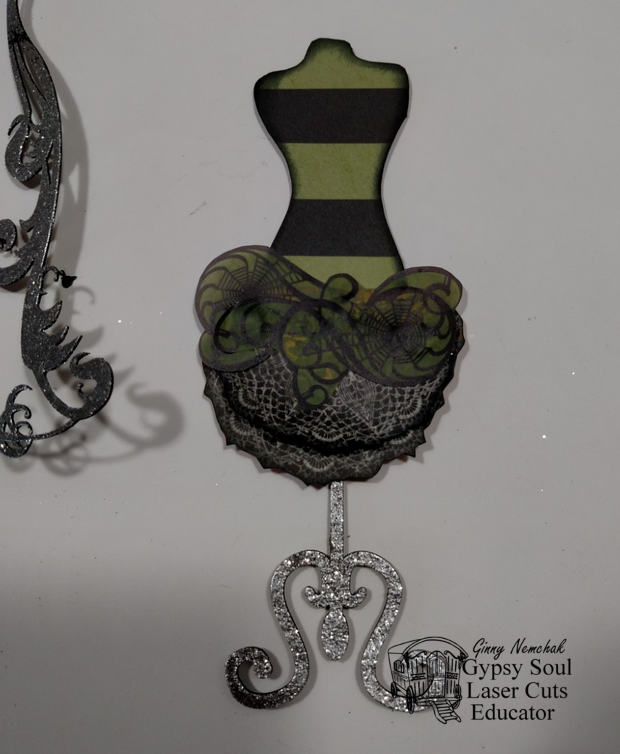 The dress form has a spooky inspired outfit on all ready for a Halloween party. I wiped down the chippies to prepare them for finishing. A little trick I’ve learned while cutting down paper to fit inside something is to add a bit of a folded tab so you can easily pull the paper out if you need to until you get the shape trimmed just right. 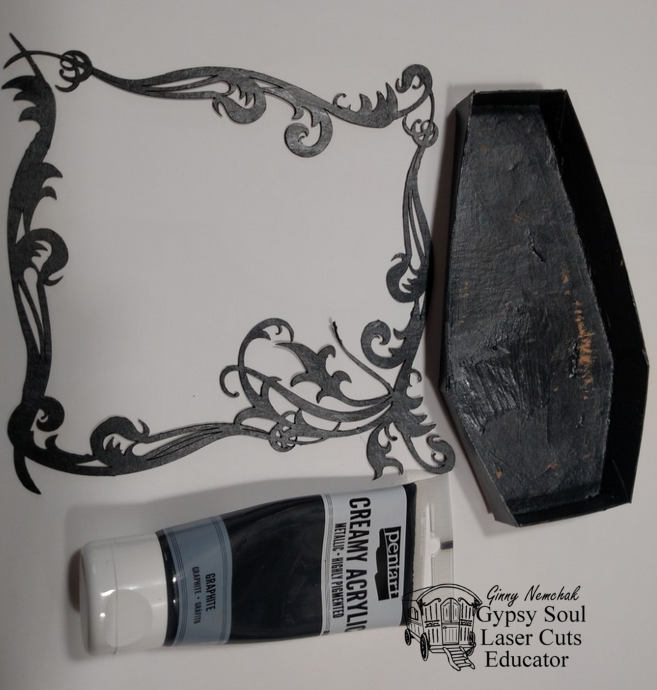 Painting the coffin box lid and flourish frame with a creamy acrylic in metallic black. 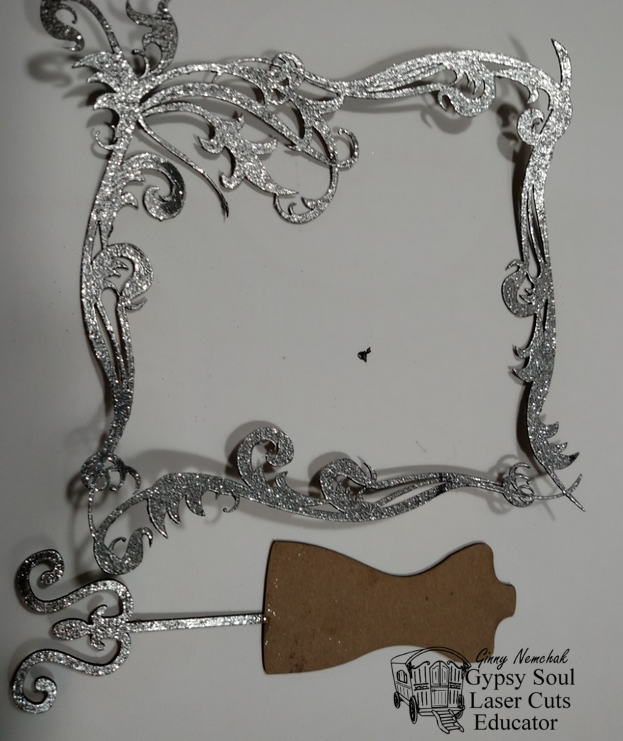 Now adding silvery embossing powder then heat setting. 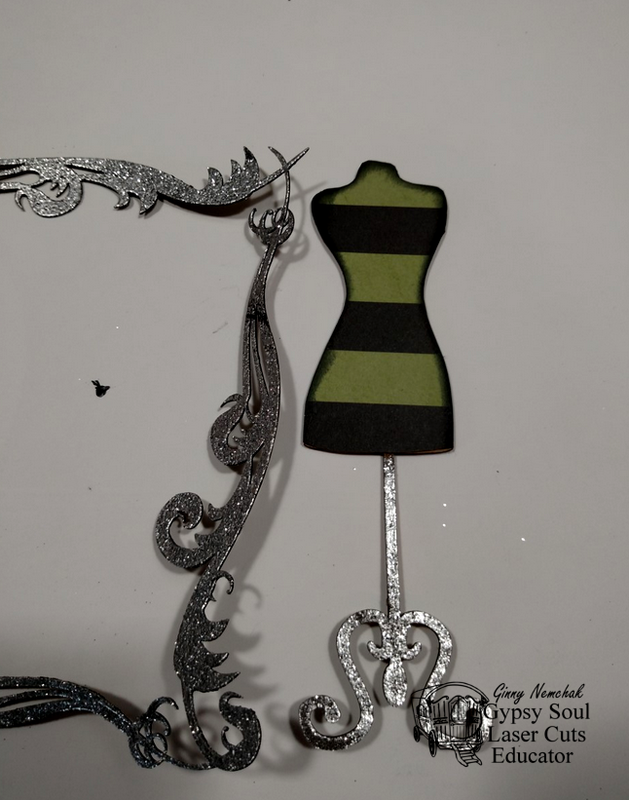 Beginning the outfit with a striped patterned paper. Using a doily patterned paper to create a skirt. Two layers of doily topped off with a spiderwebby pattern on velum. 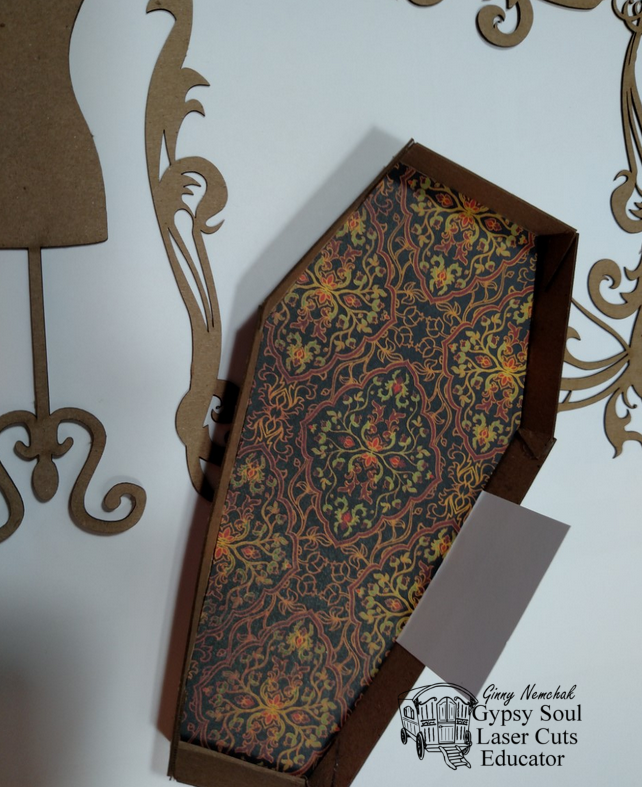 Many layers of foam tape to secure the dress form in the coffin shadow box. This also adds nice dimension. 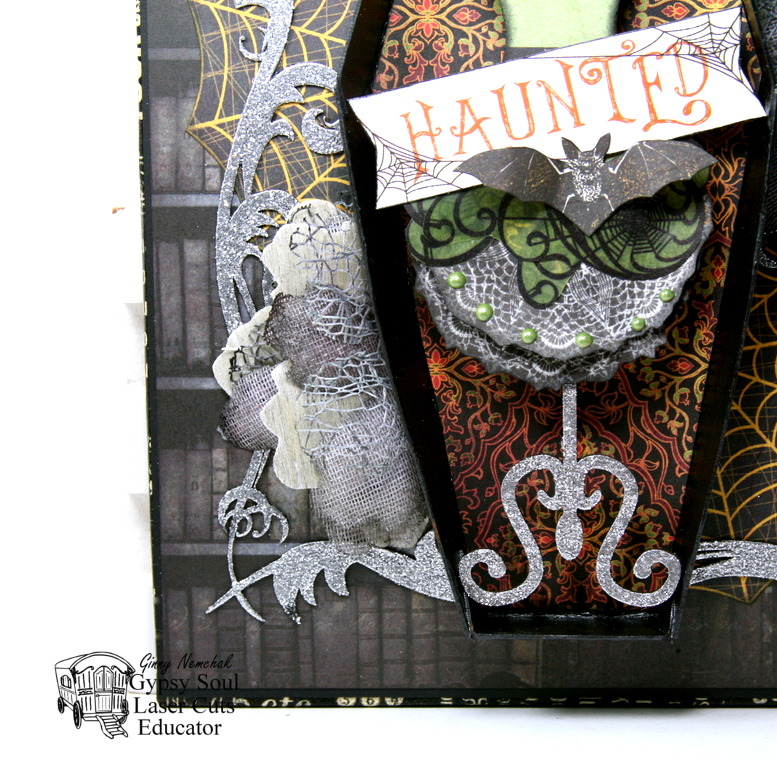 Last but not least….a haunted sign and fussy cut bat. 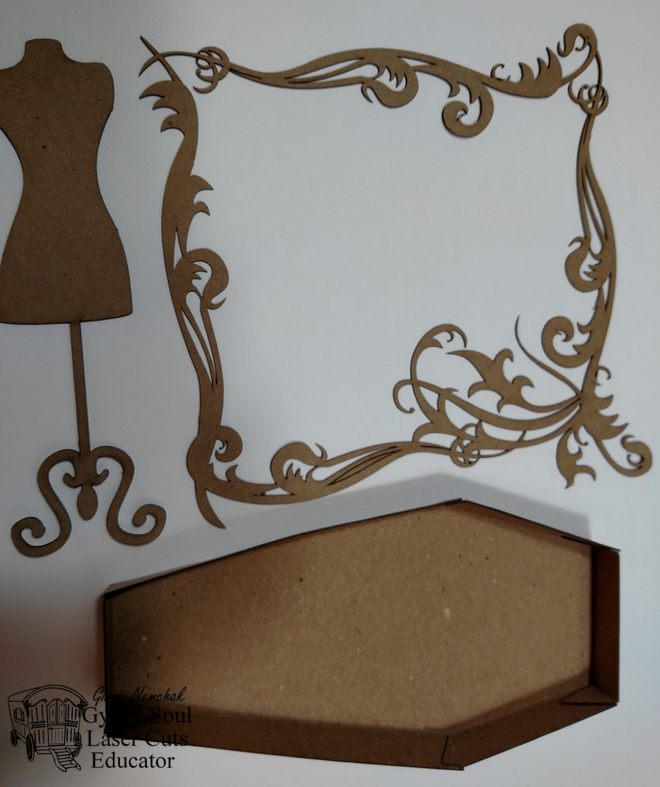 Gypsy Soul Laser Cuts~ 6 Inch Coffin Box, Fantasy Frame and Flourishes, Vintage Seamstress Shapes Set. Hey there Peeps. The leaves are starting to change here in Michigan and although we are having a bit of an extended summer…..the air will soon turn crisp and cool. I’ve already brought out my fall decor and indulging in pumpkin spice everything. 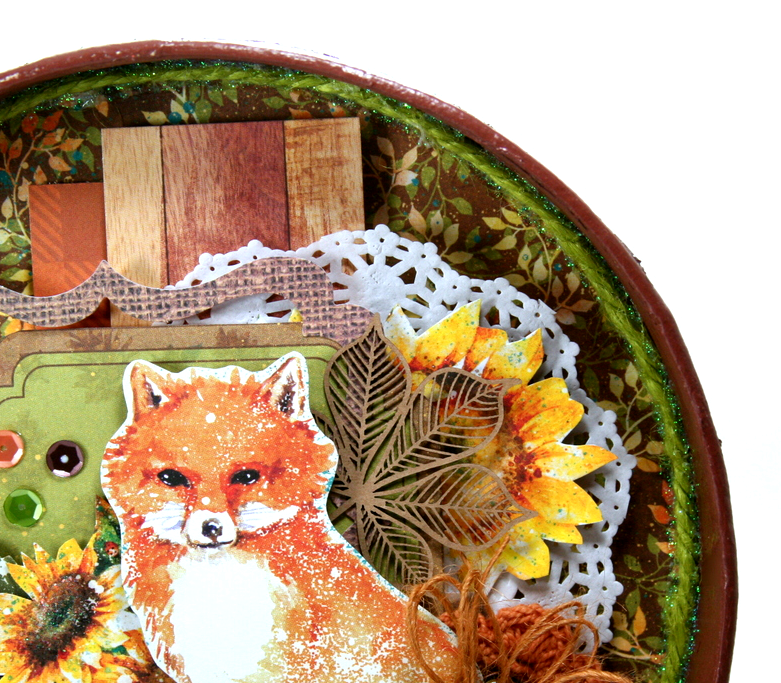 I used the new Dreams of Autumn collection to create this Fall decor piece. 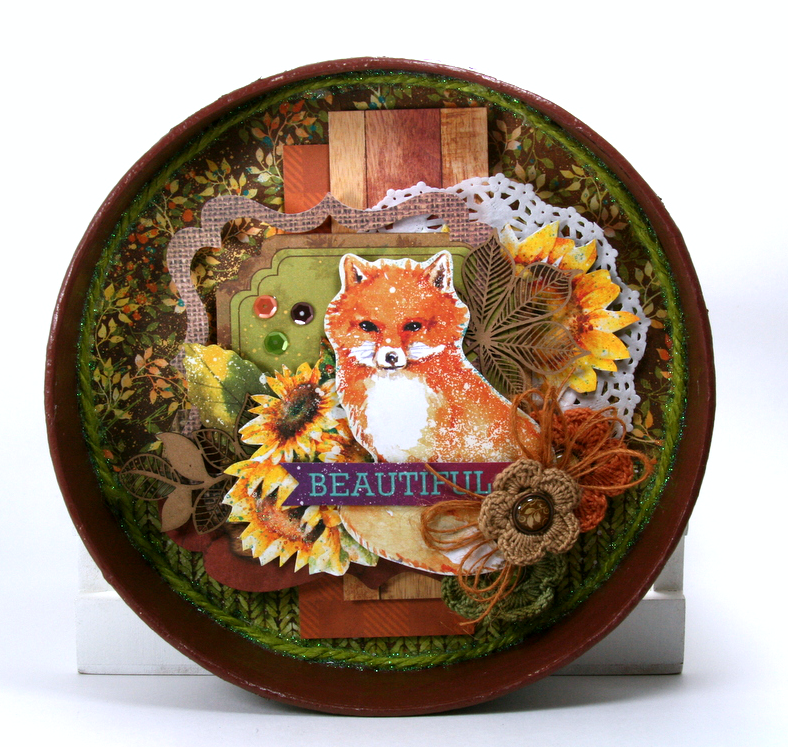 I am sooooo loving that fox image. I plan to put it on everything. No really. I am. There’s some gorgeous crocheted flowers that I accented with brads in the center and layered on top of the arrangement. 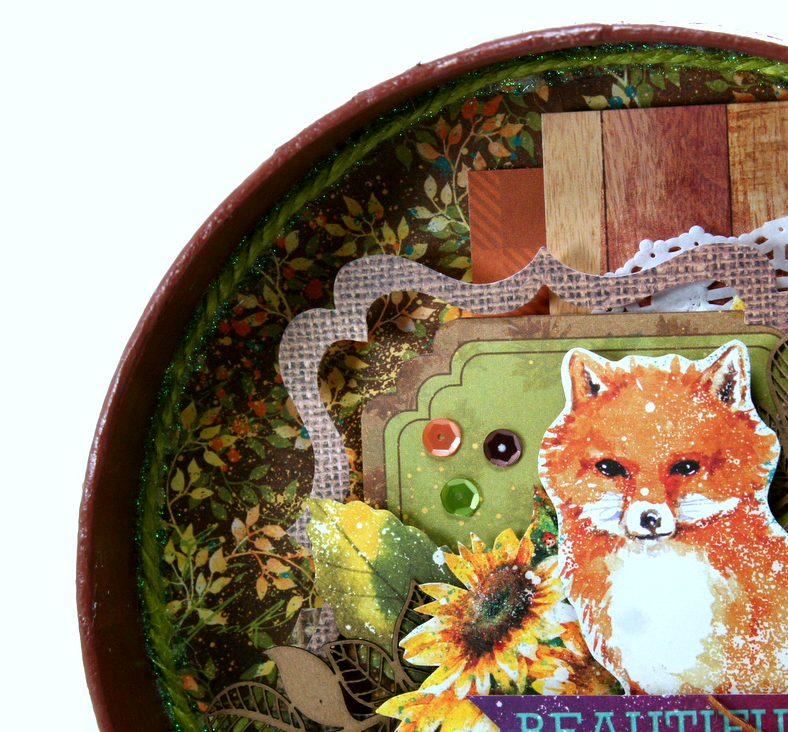 The chipboard leaves were left unaltered so as to not distract from the busy patterns. It adds a wonderful texture. The background paper is my favorite from the collection. 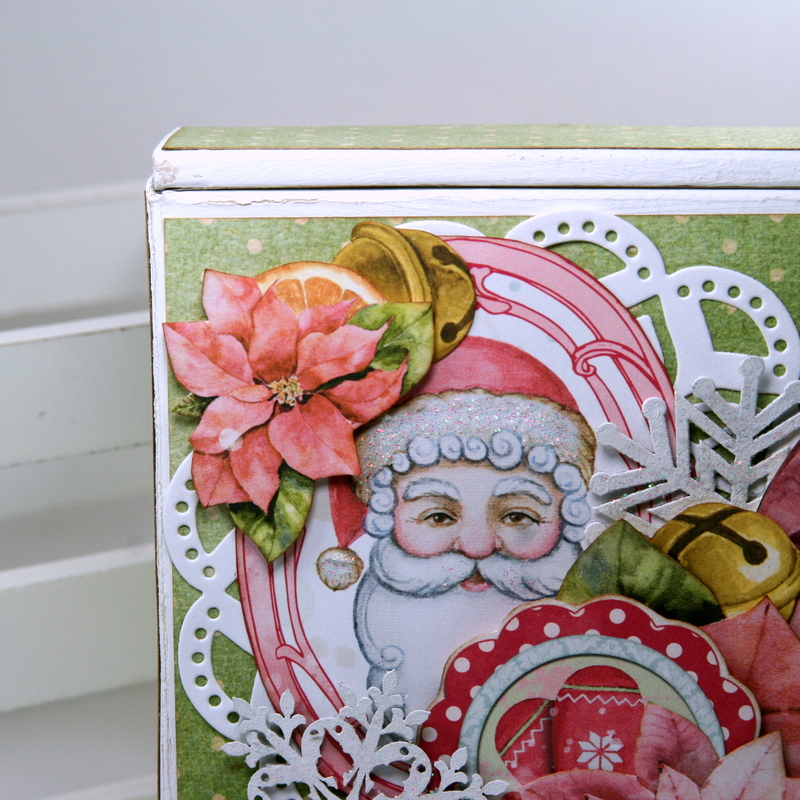 It’s added to the back of a paper mache box lid and topped off with coordinating trim. 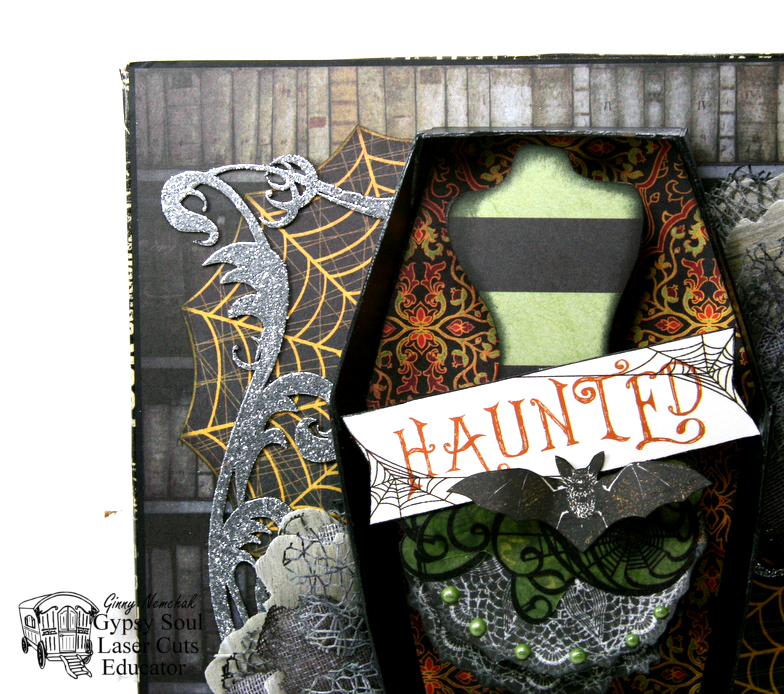 Elements from the Ephemera Kit and fussy cut images are tucked in to fill in the display. Craft foam is added between the layers for depth. Last but not least a bit of twine and sequins adds perfectly coordinated accent.